There was about 30 seconds of awkward silence after Locke apologized before the ship exploded. 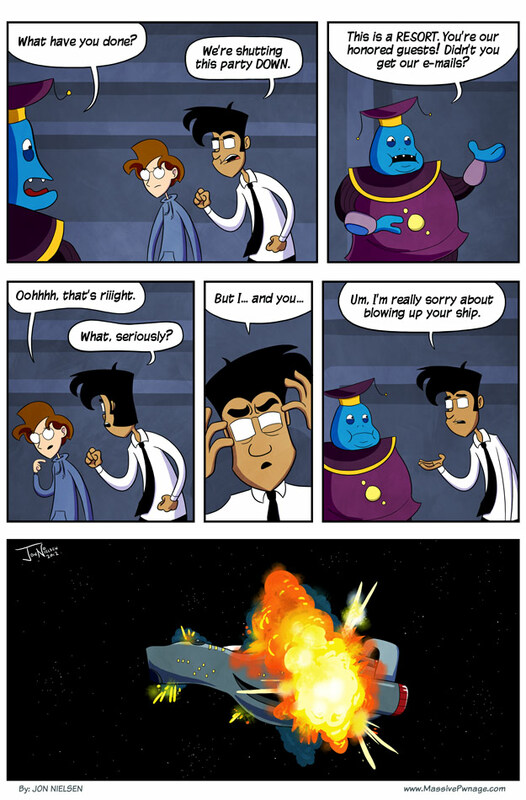 This entry was posted on Monday, March 19th, 2012 at 12:00 am and is filed under Comics. You can follow any responses to this entry through the RSS 2.0 feed. Both comments and pings are currently closed. wait, then why are there Locke and Ence replacements? The aliens couldn’t be bothered to explain to Locke and Ence’s friends too. Great, now the aliens *will* be using their planet for target practice. Like the poster before me, I didn’t see this coming; quite a good plot twist. It’ll be interesting to see how they make it out of this mess. the ship kinda reminds me of a Covenant ship now that i look at it, all those poor Grunts LOL. I wonder if this is a meta for the convention you guys just went to/ just about to go to….